« What are we birthing? Like in the first Women Moving the Edge gathering, on the evening of the third day it felt time and the right thing to do a systemic constellation. In the previous days different participants had talked about their experiences with it, and the ones who didn’t know were curious about it. 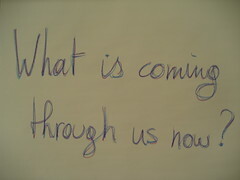 We identified our question as: What is coming through us now? As facilitator of the constellation I decided to let people choose for themselves which element was relevant within this question, which they would then represent. Two felt tired and started as observers, while lying on the sofa. Later they were asked to be representatives too: one as the Real World and one as Joy-Playfulness. In silence the representatives set themselves up: Collective Knowing, Moving the Edge, One (later named as Source), Power, Being, and the Unmanifest. I didn’t feel a lot of real movement in the whole constellation, and everything was quite ‘up in the sky’ with all these abstract elements, that’s why I chose to ask one of the observers to be representative for the Real World. This was attractive to Collective Knowing. As a facilitator, I sensed a lot of seriousness in this constellation, there was no fun or joy. So I decided to bring in Joy, who immediately started to jump around and do little dances here and there. Everyone got a smile on their face. This was much better! As we were all totally involved in this powerful experience, below you find our reflections afterwards. Power: When I leaned against Being, my backache went away. Then it felt as if she was pushing. Being: I liked the closeness. Unmanifest: I felt like an impersonal presence that had an opening (between other representatives), but somehow the conditions were not there to move forward. Then when I moved to the manifest, yes, I need the manifest. The pathway is there, but I can’t move; there is no movement yet. The conditions were not right to move. When we were shaken up by Joy, it was a shaking. I was an impersonal energy. “It doesn’t matter!” came from that unmanifest plane. It did feel lighter. At the end, feeling with One and Being (standing with the three of them next to each other), it felt very strong. I could stay there; I was gathering strength. What happened in front of us became irrelevant. Power: I felt very good with the three of you behind me, the truth was of connection and satisfaction as I looked at the scenario in front of me (Collective Knowing was invited by Real World to be next to her). It felt better when I come closer to The Edge. I felt more connected with what was behind me. I was beginning to feel to sit at the foot of the Real World. The One: As the One the first experience was a vast, impersonal condition. I realized there was nothing separated. I also noticed that I am real, the veil of the unmanifest. I engage only when I was summoned, I was so vast and full. Not one time did anyone turn to me and use it (this vast resource)!I rose up in the presence of being. There was a symmetry: The Being, the One and the Unmanifest, they were common. The only way of moving was by invitation, but nobody engaged us. Don’t you understand that something is here for you!!! I can’t join the world; it wouldn’t be weak, it couldn’t be … I wanted you to know that.. the veil of the unmanifest would be pierced and form would happen. Edge: I was realizing what you spoke – just now – Moving the Edge needs to turn inwards to Source first! I was facing out in the constellation instead of in! I remember feeling very isolated in the beginning, and later connected with the Real World; it felt more connected but still not fully connected, not connected back here, and so not connected to the world. Joy: I gave myself a role as Resting before. It was part of the whole: out of Resting came Play! It seemed to me that the sense of loneliness began to shift when the Playfulness came in. It brought everybody together, there was giggling in the back, a sense of connectedness that eased it all, when I came in. Collective Knowing: There were multiple things going on for me. Immediately I felt I wanted to be connected with everything. I wasn’t sure how to make that happen. I was the way through for Source. What was really an awakening was that the world wanted me next to her! Maybe Collective Knowing is closer to the world than I imagined. Maybe it is closer than we know. Maybe it is just that close. It was as if I had a baby in my arms. Yet there had to be a stepping back from the World to still be in a place to work with the other elements. The playfulness is so important!!! All the pieces are important! They were so close, Collective Knowing is so close to moving from the unmanifest to the manifest. Power: We are all aspects of the One. Joy: Maybe for me the place where I got stuck was almost that the Oneness or Source is so fluid… you are nowhere and everywhere at one time. It didn’t feel right to be in one position. Maybe also for the Unmanifest… Collective Knowing found the right place, but the One and Unmanifest needed to be all over the place, instead of behind (where they ended up in the end) or at the side, that could have made it more coherent. Collective Knowing: What I saw at a certain point: Playfulness brought in a sense of lightness. And that brought a clarity of seeing and knowing that was not there before. We can see more clearly when there is fun around. When did we forget to ask? Perceval (in the legend of King Arthur) doesn’t ask the question, because he wants to be polite. The question was: Whom does the Grail serve? It took him 5 years to find it out he needed to simply ask the question. One: I had the experience of transcending your personal identity, it had the appearance of arrogance, unquestioned knowing, no ambivalence… contraindication in the feminine model… it still pushed the limits of what I could speak… it had no … it knew self so well, there was only the Is-ness. There was no such thing as unclear, or pause, … If you want to take that position… a very interesting place to explore. You can’t stop anything! Being: I had the ongoing question: Why isn’t the One with me? I was not in the place of the all powerful aspect. I see now I have been equating Being with Source, but I was the consciousness aspect. As Being I saw myself first as unmanifest, but it changed to a more manifest Being, the inbetween space, between Source and manifestation. After this shift, I felt the different role… my back did stop hurting…. I am still not clear… There was more an idea in the beginning; it came out differently. Edge: I am sitting here with a thought “I let the side down”. If I take off that edge of what stopped me asking. What struck me the most is what One said now. The grail serves the grail king; the source… it is like a turn around in my head, in my knowing I know the truth. I let down by not asking, into the real world… I can’t disentangle myself form the role. How much is me? How much is the role? Still the question is: One was waiting to be invited. I only realize now that I was looking outwards, instead of looking in, we don’t do this asking! In the hot tub this morning… the sun before us, and there is the moon… at the back. How to have it both at the same time? I started off in the constellation to look outwards, even when I looked inwards, if I am not viable that is OK to abdicating the power. I am the power by asking. Power: I felt met, I felt resignation, to move the edge is going to be really difficult and sort of squeezing of something, but I will do it sort of thing. But if everything is One or Being, then moving the edge isn’t difficult. Power is simply alignment; that is what it is. Being: you were rebuffed by Power… the rebuff of power seemed to have an impact on the situation. Being: It was perfect. You are not responsible for the role you stood in; for all of us. This entry was posted on Tuesday, November 6th, 2007 at 4:09 pm and is filed under collective wisdom, constellation, mystery. You can follow any responses to this entry through the RSS 2.0 feed. You can leave a response, or trackback from your own site. thought you might like to know that this blog entry came up on my google blog alert for systemic constellations. I am impressed myself! Thanks for letting me know.